Timpanogos timelapse, a reverse setting sun? 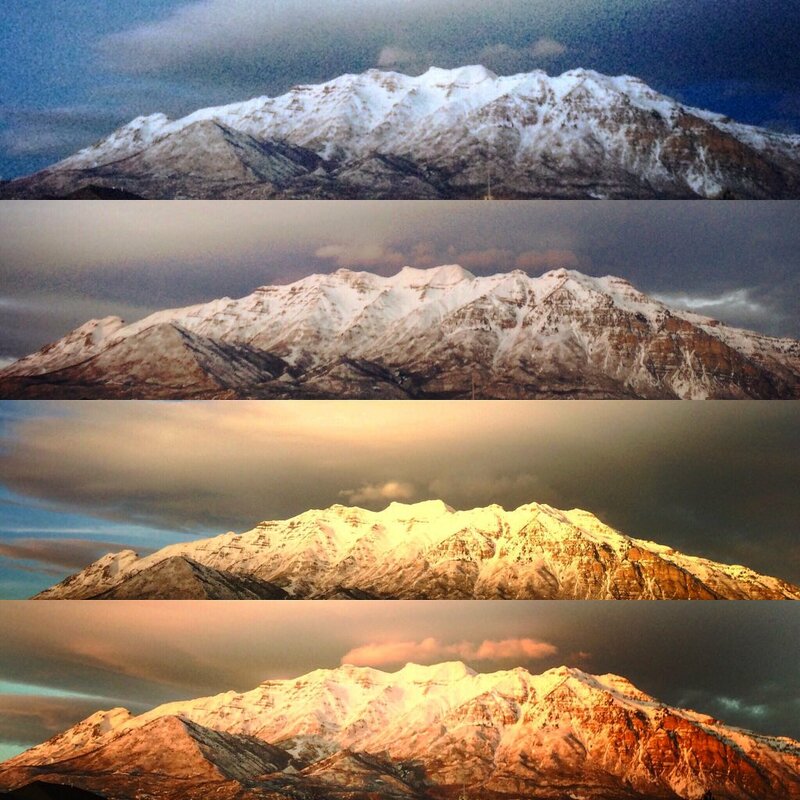 Again from Twitter, a series of photographs of Utah’s Mount Timpanogos. From top to bottom, it looks like a sunrise on the mountain. But Timpanogos faces west; the sun rises from behind this face. Two possible explanations. The more mundane explanation would be that the series starts with the bottom photo, progressing to the top. Shadows support that explanation. The slightly more colorful explanation would be, as we often see here in Texas, weather moving from west to east; and in the late afternoon a cover of clouds moves far enough east that the setting sun finally is uncovered, peeking out from underneath the clouds to light the land with that wonderful golden hour sun for a few minutes, before setting. Timpanogos, like the rock it is, sits majestically either way. I Tweeted Ms. Adams (I’m presuming her name to be Sofia Augustine Adams) to ask which it is. For those who love Timpanogos, it won’t matter much. My guess is the photo was taken from south of Orem, Utah, probably near Interstate Highway 15 which transects Utah County. Update: Ms. Adams informs us (see comments) it is a setting sun, with the bottom photo being the first in the series. Thank you! Utah’s Mount Timpanogos rises on the east side of Utah Valley, in Utah County, over Utah Lake. At about 6,000 feet above the valley floor, the mountain can make its own weather at times. On a cold winter morning, sun struggling to climb over the peak can expose clouds from sublimating ice on the mountain, or clouds from ice crystals blown off the top slopes. Any way they form, it can be a spectacular start to another day. Much of my childhood was spent about five miles south and east of the spot this photo was taken (American Fork?). The mountain filled most of my bedroom window. A sunrise like this one would look like a forest fire in my room. But film was expensive, and my camera was a snapshot special. Thanks to @CharBailey5479, whoever you are. Let me state right up front that the only reason I’m posting this is because of the cameo appearance of Mt. Timpanogos in this video. 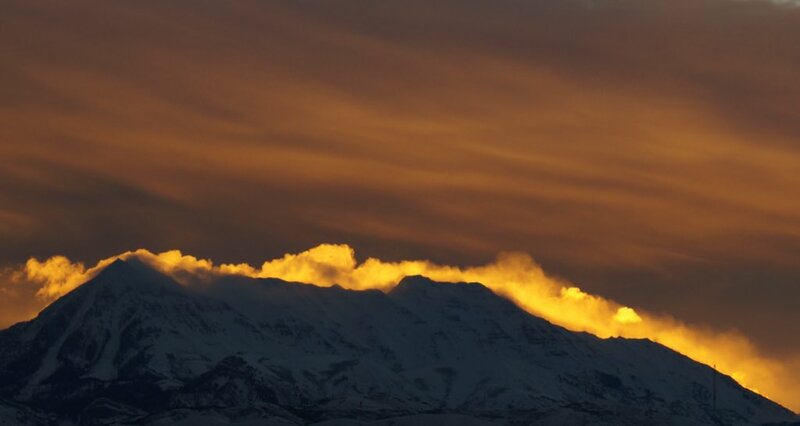 The sun is setting in the west; Timpanogos is that biggest mountain to the east. Never heard of this guy before, the pianist William Joseph; found it through a clip in the Deseret News in Salt Lake City. I understand there’s a platform hiding beneath the water. When my grandfather, Leo Barrett Stewart, Sr., was a child, about ten miles south of where this film was shot, he said one could paddle a boat out to the middle of Utah Lake, and see the bottom, picking the trout one wished to fish for. That was before the invasive carp was introduced. It would be wonderful to see Utah Lake restored to the point that you could see the platform holding the piano. Filming and credit details from devinsupertramp below the fold. Found just the perfect photo of Mt. Timpanogos and the U.S. flag. I may use it a lot, unless Bob Walker, the guy who took it, complains. No, I have no idea who Bob Walker is, other than some guy on Facebook, who lives in Orem, Utah (and may be a member of the Mormon Tabernacle Choir). Mt. Timpanogos and the U.S. flag. Photo by Bob Walker of Orem, Utah; from Orem, circa September 2012. That’s Mt. Baldy on the left. This site is about six miles from our old home in Pleasant Grove, Utah. And, again, yes, you may fly your flag today, any day. According to the flag code, flags can be flown any day, appropriately, in addition to the score of dates recommended in the Flag Code. Here’s a good demonstration of why you don’t need PhotoShop, but a decent camera and a steady hand instead. Utah’s Mt. Timpanogos in snow, by Craig Clyde, 2012 (rights probably reserved). Click for larger version. Craig Clyde took this photo of Utah Valley‘s Mt. Timpanogos, probably from Saratoga Springs, on the west side of Utah Lake, after one of the first snows of 2012. (This area had a few farm fields when I grew up there.) It’s a great photo for several reasons. It’s a formerly unusual view, there being so few people on the west side of the lake until recent development. It pictures all of Timpanogos, with American Fork Canyon on the left, Mahogany Mountain, Big Baldy, and Provo Canyon on the right. It’s an afternoon shot, you can tell from the angle of the sun (the mountain runs on a north-south axis), and the darkness on the lower mountains may be caused by the Sun’s setting behind the mountain range on the west side of the lake. Timpanogos in white, in the afternoon sunshine, is one of the greatest images of a mountain you’ll ever see. Tip of the old scrub brush to Craig Clyde. Mr. Clyde and I attended high school together — haven’t seen him in more than 30 years; not sure, but I don’t think he’s the same Craig Clyde in the movie business.